This workshop is SOLD OUT. Please CONTACT US if you'd like to be put on the waiting list. Working with natural indigo (no chemical additives or assists) on up-cycled textiles, participants will learn how to set up a natural indigo vat and will explore a range of simple resists for patterning, including tie and clamp resists. Bring your own second-hand cotton or linen shirt (white is best) to up-cycle and choose from fabrics we will have on hand while trying your hand at Indigo dyeing using clamp-resist and a variety of wrapping and stitching techniques. All levels of experience are welcome. Textile designer Rachel MacHenry received her M.A. from Central Saint Martin's College of Art and Design in London, England. She has also studied at the Rhode Island School of Design, and was an artist-in-residence at Harbourfront Centre in Toronto, Canada. 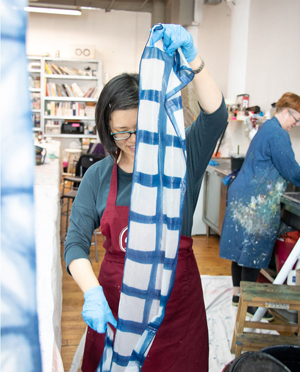 Between 2002-10, she was Studio Head/Textiles for the Craft & Design Program at Sheridan College in Toronto, and she is a founding member of the Contemporary Textile Studio Co-operative. As a designer, she focuses on the sustainable and innovative use of materials for functional textiles. Her design research centres on fair trade and environmental production and, in addition to developing studio textile work, she designs for artisan-made production. Rachel has worked extensively with community-based co-operatives in South Asia to develop textiles using local materials for overseas markets. Her eponymous children's knitwear and felt line is produced with community cooperatives in Nepal and India, and is marketed in the United States, Europe and Japan. Clients include catalogue companies, museum shops and high-end retailers, and the line has been featured in magazines such as the New York Times magazine, Martha Stewart Magazine and others. She has also been involved in curating exhibitions related to textiles and design, and her work is part of the permanent collection of the Victoria and Albert Museum in London, England. Ganaele Langlois' work combines screen-printing, photography and writing to create mixed media artist books. Her work explores the opening of the self: the rhythms of living, remembering, becoming and unfolding in everyday encounters. She uses repetitions of patterns and images to create rhythmic layers. Her work plays on the contrast between figuration and abstraction to re-create moments of openness and transformation.